Most people have not even heard of millet; much less understand the benefits of millet nutrition. And yet, millet is one of the best-kept secrets of our ancient ancestors. Millet has been around for thousands of years and is found in many diets around the world, including India, China, South America, Russia and Egypt. In fact, while it's often called a grain because of its grain-like consistency, millet is actually a seed. Millet is more than just an interesting alternative to the more common ‘grains’. For many years, researches have been done on the health benefits of millets, and found millets helpful in improving the overall well-being by providing nutrients essential for our health. Millet should be included on your list of heart-healthy choices because of its status as a good source of magnesium. Magnesium has been shown in studies to reduce the severity of asthma, lower high blood pressure and reduce the risk of heart attack. The phosphorus provided by millet helps forming the mineral matrix of bone and aids in the metabolism of fats. Phosphorus is also an essential component of lipid-containing structures such as cell membranes and nervous system structures. Millet can help lower risk of type 2 diabetes. Magnesium in millet acts as a co-factor for more than 300 enzymes, including enzymes involved in the body's use of glucose and insulin secretion. Because millet is so high in fiber, it’s a great food for digestive health. Fibers aid in the prevention of constipation, diarrhoea, haemorrhoids, and other digestive issues, as well as help prevent colon cancer, which is one of the top cancer killers in Malaysia. Millet contains significant amounts of phenols. These compounds function as antioxidants that help prevent oxidative stress and damage in the body caused by harmful free radicals, according to Indian Journal of Biochemistry and Biophysics. 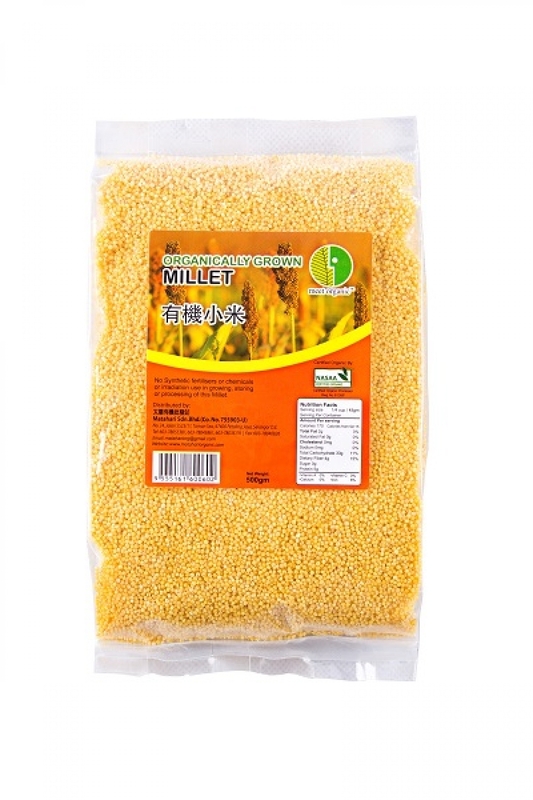 Millet is gluten-free, non-allergenic, and alkaline. A great alternative food for sensitive individuals. Millet’s high protein content (15 percent) makes is a substantial addition to a vegetarian diet. Rinse it thoroughly and add one part millet to two and a half parts boiling water or broth. After the liquid has returned to a boil, turn down the heat, cover and simmer for about 25 minutes. The texture of millet cooked this way will be fluffy like rice. If you want the millet to have a more creamy consistency, stir it frequently adding a little water every now and then. Cooked millet can be served as a breakfast porridge to which you can add your favourite nuts and fruits. Toss cooked and chilled millet with your favourite chopped vegetables and either chicken or baked tofu cubes. Add dressing. An easy way to prepare, delicious meal.